Please Note: The following information is only relevant to CIRCLY 6.0, not CIRCLY 7.0. 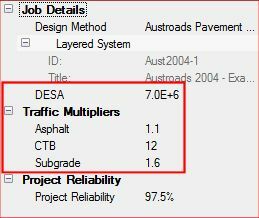 The references below are to the Austroads Guide to Pavement Technology – Part 2: Pavement Structural Design (AGPT02-12), February 2012. • quad-axle with dual tyres (QADT). Design traffic loading is commonly described in terms of the number of Equivalent Standard Axles (ESA). Design traffic so described does not, by itself, contain enough information for the design of pavements containing one or more bound layers. The design traffic loading for flexible pavement design is – for each relevant damage type – the total number of Standard Axle Repetitions (SAR) during the design period which cause the same damage as the cumulative traffic. Full details are in Chapter 7 of AGPT02-12. The design traffic calculated in terms of ESA of loading is converted to SAR of loading using the average SAR/ESA value for each damage type. These factors are determined from the Traffic Load Distributions (TLDs) that characterise actual or presumptive traffic data. The key point is that the Traffic Multipliers depend on the assumed Traffic Load Distribution. 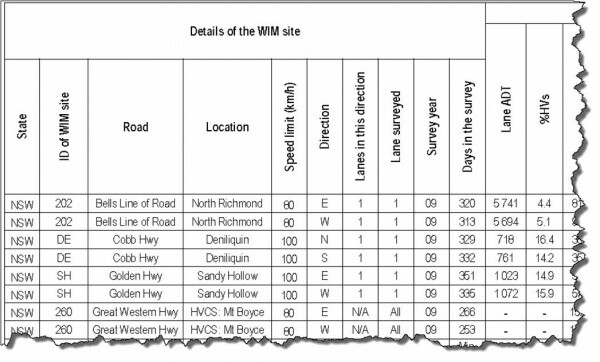 APPENDIX D (CHARACTERISTICS OF TRAFFIC AT SELECTED WIM SITES) has many examples. 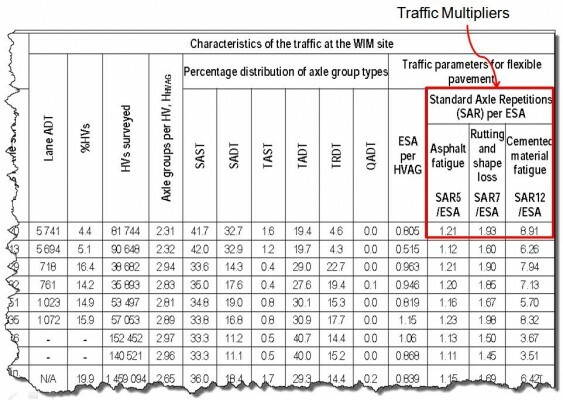 Details of the procedure to estimate ESA/HVAG and SAR/ESA from a selected TLD are given in Appendix H.